Oscar-nominated “Bohemian Rhapsody” comes to 4K Ultra HD, Blu-ray and DVD Tuesday Feb. 12. Viewers can experience the story behind the band and the making of “Bohemian Rhapsody,” the No. 1 streamed song of the 20th century and other favorites like “We Will Rock You,” “Somebody to Love,” “We are the Champions” and more. The film is also available now on Digital and Movies Anywhere. “Bohemian Rhapsody” is an enthralling celebration of the rock band Queen, their music, and their extraordinary lead singer Freddie Mercury (Rami Malek, “Mr. Robot”), who defied stereotypes and convention to become one of history’s most beloved entertainers. Following Queen’s meteoric rise, their revolutionary sound and Freddie’s solo career, the film also chronicles the band’s reunion, and one of the greatest performances in rock history (Hint: Live Aid). For the first time, fans can experience a truly one-of-a-kind music movie event with the complete “Live Aid” movie performance featuring two never-before-seen songs (“Crazy Little Thing Called Love” and “We Will Rock You) packed into a 22-minute collective experience recreating the original event. 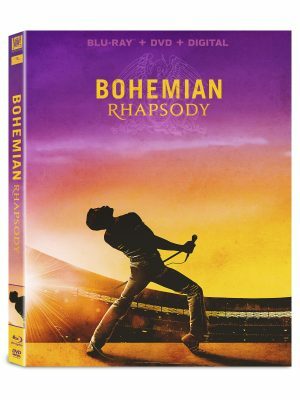 In addition, on Blu-ray and Digital, fans will get a look behind the making of the film including interviews with Queen, the cast and creative team. Comedian Tiffany Haddish stars in Tyler Perry’s “Nobody’s Fool,” arriving in a Blu-ray Combo Pack and on DVD Tuesday Feb. 12 from Paramount Home Media Distribution. The comedy also is available now on Digital platforms. The Digital and Blu-ray Combo Pack releases are loaded with more than an hour of wildly funny bonus material including an outrageous gag reel, over 20 minutes of deleted, extended and alternate scenes not seen in theaters, a special introduction by Perry and Haddish, as well as nine featurettes. Trying to get back on her feet, wild child Tanya (Haddish, “Girls Trip”) looks to her buttoned-up sister Danica (Tika Sumpter, “Ride Along”) to get her life together. As these polar opposites hilariously collide, Tanya discovers that Danica’s picture-perfect life— including her online romance—may not be what it seems. With the aid of her eccentric mother (Whoopi Goldberg, “The View”), Tanya will do whatever it takes to help, even if it means completely blowing up her sister’s life. Omari Hardwick (“Power”) and Amber Riley (“Glee”) also star. Question the meaning of family and ethics of survival with the Japanese dramedy “Shoplifters,” available on DVD and Digital HD Tuesday Feb. 12 from Magnolia Home Entertainment. Director Hirokazu Kore-eda’s (“Like Father, Like Son”) explores the perseverance and tenacity of society’s outcasts and the love that sustains them with “Shoplifters,” detailing the daily lives of a group of outsiders who, through various circumstances, have found themselves on the outskirts of society, but bonded together in a pursuit of survival. Centered on a family’s penchant for petty theft and grifting, the film’s portrayal of the moral complexities of poverty and child welfare have. Kore-eda’s masterful approach to depicting the human connection, as previously seen in his 2013 Cannes Jury Prize winner “Like Father, Like Son,” allows “Shoplifters” to achieve. “Shoplifters” will be available on DVD for the suggested retail price (SRP) $26.98 and on DigitalHD via Prime Video, iTunes, Google Play, FandangoNOW. The animated family adventure comes home when “Norm of the North: Keys to the Kingdom” arrives on DVD and Digital Tuesday Feb. 12 from Lionsgate. It also is available now On Demand. This Dove Family-Approved sequel to the 2016 animated hit “Norm of the North” not only brings back the furry titular hero (the newly crowned polar bear king of the Arctic), but it also introduces all-new characters going on all-new, wild adventures. “Norm of the North: Keys to the Kingdom” DVD will be available for $19.98 (SRP). From the producers of “The Fall,” “Bang, Series 1” makes its DVD debut from Acorn TV Tuesday Feb. 12. The Welsh drama follows an ambitious police officer Gina Jenkins (Catrin Stewart, “Doctor Who,” “Misfits”) and her troubled brother, Sam (Jacob Ifan, “Cuffs”). When Sam gets ahold of a gun, he sets off on a crime spree that endangers not only his life, but also his sister’s future in the force. The series also stars Jack Parry-Jones (“Our Girl”), Nia Roberts (“Hidden”) and Gwyneth Keyworth (“Black Mirror”). Loner Sam and his ambitious sister, Gina, live in a decaying steel town in South Wales. Since the death of their father 12years earlier, the two have taken divergent paths. Gina has a promising career in the police force, but Sam’s life is going nowhere—until one day he gets his hands on a gun. Emboldened by newfound confidence, he begins to commit increasingly daring crimes. Meanwhile, Gina is investigating the killing of a local car salesman. When the police connect the murder to Sam’s gun, Gina makes it her mission to find the owner of the weapon. But as she digs deeper, she discovers information about her father’s unsolved murder that will send shock waves through her troubled family. The three-disc DVD set features eight episodes, plus a bonus behind-the-scene featurette ($49.99, Amazon.com). “Bang” made its U.S. premiere in October on Acorn TV, North America’s most popular streaming service focused on British and international television from RLJ Entertainment and AMC Networks. Acorn TV presents the DVD debut of “Ackley Bridge, Series 2” Tuesday Feb. 12. The school-based British drama offers a gritty, funny and truthful insight into the daily drama of teachers, teenagers and families whose lives and cultures collide in a fictional 21st century Northern town. It’s the start of a new term at Ackley Bridge, and lives and cultures are still colliding at this high school that integrated a community of white and Pakistani residents. Smart student Nasreen (Amy-Leigh Hickman, “EastEnders”) tries to hide her sexuality behind a sham engagement, while her best friend, Missy (Poppy Lee Friar, “Mr Selfridge”), must shoulder the burdens of her drug-addict mother. Free-spirited English teacher Emma (Liz White, “Life on Mars”) embarks on an affair with a married staff member, and headmistress Mandy (Jo Joyner, “EastEnders”) introduces a strict academic regime that infuriates staff and students alike. The ensemble cast also includes Paul Nicholls (“Law & Order: UK”), Adil Ray (“Citizen Khan”), Arsher Ali (“The Missing”), Samuel Bottomley (“Wolf Hall”) and Sunetra Sarker (“Broadchurch”). “Ackley Bridge, Series 2” made its U.S. premiere in September on Acorn TV, North America’s most popular streaming service focused on British and international television from RLJ Entertainment and AMC Networks. The three-disc DVD set features 12 episodes, plus bonus behind-the-scenes featurettes ($59.99, Amazon.com). Calling all Tyler Perry fans! Front Row Features is giving away a copy of the writer-director’s latest comedy, “Nobody’s Fool,” on Blu-ray/DVD Combo Pack to two lucky readers. To enter the contest, simply email socalmovieeditor@aol.com by Feb. 19 for your chance to win. Good luck! Next PostPhotos: ‘Nobody’s Fool,’ More on Home Entertainment … Plus Giveaways!! !